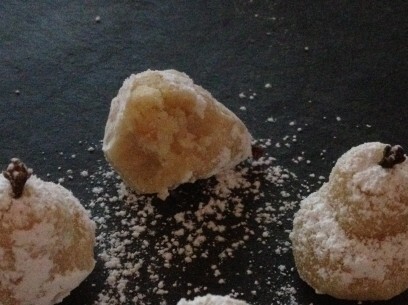 Amigthalota are the traditional Greek version of marzipan. 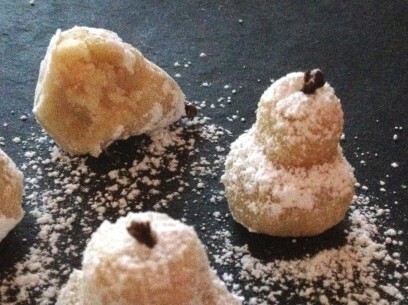 These delicate almond sweets are often served at weddings and baptisms with their perfect pear shapes and snowy cover of powdered sugar – as beautiful as they are delicious! Five ingredients and twenty minutes are all you need to whip up a batch of your own. Almond extract and rose water give the marzipan center the most wonderful fragrance and a whole clove tops each pearl white pear making this an aromatic as well as incredibly tasty treat. One bite through the just ever so lightly crisp outside into the dense, chewy, almondy amazing center and you’ll be hooked – they’re just that good! Almond meal, powdered sugar, almond extract, rose water and water – that’s all you’ll need to make this infinitely scalable recipe. The ingredient measurements listed below make for an even dozen and a half (18) amigthaloti and I’ve successfully quadrupled this recipe with fantastic results. The trick is to follow these few, easy instructions below EXACTLY as written. Trust that I’ve done the experimentation for you, worked all the kinks out and that this is the way to perfect traditional Greek marzipan every time! Sift the almond meal and powdered sugar together in a bowl. Do sift whenever you have time as it’s important for a smooth almond paste. Set aside. Measure out into a small bowl or cup the almond extract and rose water. Set aside. In a pot, add water and bring just to a boil. Immediately add the almond extract and rose water and quickly bring the heat to LOW. Swirl the water to incorporate the flavors and then add the sifted almond meal and powdered sugar. Remove from heat and, preferably using a fork, quickly quickly work to combine all ingredients into a crumble. 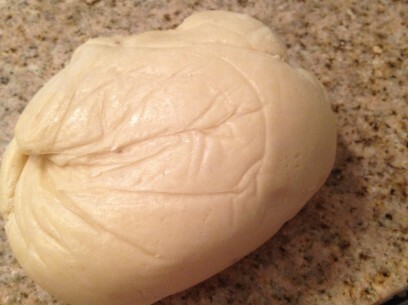 Transfer crumbles to a large bowl and knead into a smooth ball of dough. This can take anywhere from 3-4 minutes and will still be warm, though not too hot to handle. Pinch off pieces about the size of a heaping tablespoon and roll balls in your hands. Just lightly dip your fingers into a bowl or cup of room temperature water and carefully shape almond paste into pear shapes. DO NOT — — USE A LOT OF WATER! Dip the tips of your fingers in and shake off the excess – a little goes a long way in this application. 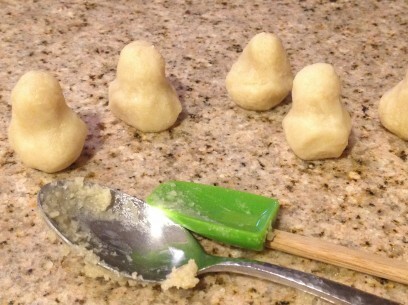 Line up shaped pears and allow them to cool completely. This takes about 20-30 minutes. 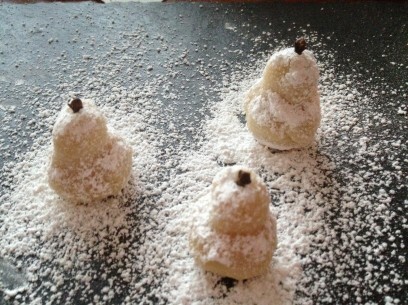 When cool, and not before or sugar will dissolve, dust liberally with powdered sugar. As a finishing touch, insert a whole clove into the top of each pear. Feel free to make these up to five days ahead. They keep well, covered in a cool place. You can refrigerate but remember to allow them to come to room temperature before serving. Hi! I’m taking the Rouxbe Plant-Based online course and your website was mentioned online by one of my classmates. So I’ve started exploring your site and it seems great! I have a question about the marzipan – is there something I could use in place of rosewater? I don’t want to buy a whole bottle just to use a tablespoon or so of it. Thank you! Just wondering if you know what Rosewater and almond extract are in Greek? I haven’t noticed them in the supermarket here in Greece. Rosewater is rodonero/ροδόνερο and almond extract I’m not too sure, let me ask!